 Administrator, Wackenhut Security, Inc.
 Clerk, You & Me Naturally, Inc.
HB225 RELATING TO STATE HIGHWAYS. HB238 HD1 RELATING TO ELECTRIC VEHICLES. HB239 RELATING TO FUEL CELL ELECTRIC VEHICLES. HB240 RELATING TO MOTOR VEHICLES. HB241 HD2 SD1 RELATING TO MOTOR VEHICLES. HB248 HD1 RELATING TO EARLY LEARNING. HB249 HD1 RELATING TO SCHOOL PSYCHOLOGISTS. HB250 HD2 SD1 RELATING TO SCHOOL-BASED HEALTH SERVICES. HB282 RELATING TO CAPITAL IMPROVEMENT PROJECTS FOR THE BENEFIT OF THE THIRTY-EIGHTH REPRESENTATIVE DISTRICT. HB300 RELATING TO EMERGENCY PREPAREDNESS. HB301 RELATING TO HOMEOWNERS' ASSOCIATIONS. HB302 RELATING TO HOMEOWNERS ASSOCIATIONS. HB303 HD1 RELATING TO OCCUPATIONAL HEALTH AND SAFETY. HB304 HD2 RELATING TO TRANSPORTATION. HB305 HD1 RELATING TO CROSSWALKS. HB306 RELATING TO COUNTY LAND USE REQUIREMENTS. HB307 SD1 RELATING TO RENEWABLE ENERGY. HB308 RELATING TO SHOPPING CARTS. HB309 HD1 RELATING TO TRANSPORTATION. HB310 RELATING TO ON-SITE EARLY CHILDHOOD FACILITIES. HB313 RELATING TO FUEL TAX FUNDS. HB314 HD1 SD1 RELATING TO GIFT CERTIFICATES. HB319 RELATING TO THE CONVEYANCE TAX. HB323 HD1 SD1 RELATING TO MOTOR VEHICLE REGISTRATION. HB324 HD1 RELATING TO TRANSPORTATION. HB325 HD1 RELATING TO DRIVING WHILE INTOXICATED. HB326 HD1 RELATING TO COMMERCIAL DRIVER'S LICENSES. HB327 HD1 SD1 RELATING TO TRANSPORTATION. HB328 RELATING TO TRANSIT-ORIENTED DEVELOPMENT ZONES. HB401 HD1 SD2 RELATING TO CONTRACTING FOR PUBLIC FACILITIES. HB421 HD2 RELATING TO THE GENERAL EXCISE TAX. HB432 RELATING TO PLANNED COMMUNITY ASSOCIATIONS. HB433 RELATING TO MOTOR VEHICLES. HB445 HD1 RELATING TO CAPITAL IMPROVEMENT PROJECTS FOR WATER REUSE. HB446 HD1 RELATING TO FISHING. HB449 HD1 RELATING TO SUSTAINABILITY. HB451 HD1 SD1 RELATING TO THE HAWAII ASSOCIATION OF CONSERVATION DISTRICTS. HB452 HD1 SD1 RELATING TO PREFERENTIAL ELECTRICITY RATES FOR PROTECTED AGRICULTURE. HB453 HD1 RELATING TO THE HAWAII PUBLIC HOUSING AUTHORITY. HB456 HD2 SD2 RELATING TO PUBLIC SAFETY. HB457 HD1 RELATING TO DISASTER PREPAREDNESS. HB604 RELATING TO ELECTRIC VEHICLES. HB647 RELATING TO DIGITAL CONTENT BLOCKING CAPABILITIES. HB648 RELATING TO UNFAIR AND DECEPTIVE PRACTICES. HB649 HD1 RELATING TO TEACHER HOUSING SUBSIDIES. HB650 HD1 RELATING TO TEACHER RETENTION. HB651 RELATING TO THE HAWAII EDUCATOR LOAN PROGRAM. HB753 HD2 RELATING TO THE IGNITION INTERLOCK PROGRAM. HB754 HD1 SD2 RELATING TO ELECTRIC FOOT SCOOTERS. HB755 HD1 RELATING TO THE DEPARTMENT OF TRANSPORTATION. HB756 HD1 SD1 RELATING TO TRANSPORTATION. HB757 HD1 SD1 RELATING TO TRANSPORTATION. HB812 HD2 SD1 RELATING TO LOW-SPEED ELECTRIC BICYCLES. HB857 HD2 SD1 RELATING TO TRAFFIC. HB858 RELATING TO CARGO INSPECTIONS. HB1090 RELATING TO ELECTRIC VEHICLES. HB1092 RELATING TO HIGHWAY SAFETY. HB1093 HD2 SD1 RELATING TO TRANSPORTATION NETWORK COMPANIES. HB1377 RELATING TO AN AIRPORTS CORPORATION. HB1378 HD1 RELATING TO TRANSPORTATION. HCR57 DESIGNATING THE FIRST WEEK OF MAY AS TARDIVE DYSKINESIA AWARENESS WEEK. HCR60 REQUESTING THE HARBORS DIVISION OF THE DEPARTMENT OF TRANSPORTATION TO CONVENE A TASK FORCE TO STUDY THE FEASIBILITY OF ESTABLISHING A HAWAII COMMERCIAL HARBORS AUTHORITY. HCR85 REQUESTING AN AUDIT OF DEPARTMENT OF TRANSPORTATION PUBLIC WORKS PROJECTS AT THE DANIEL K. INOUYE INTERNATIONAL AIRPORT. HCR96 URGING THE CITY AND COUNTY OF HONOLULU TO WORK WITH STATE IN DEVELOPING STRATEGIES TO PROVIDE ASSISTANCE TO THE HOMELESS AND REDUCE THE NUMBER OF HOMELESS INDIVIDUALS IN WAIPAHU. HCR97 REQUESTING THE DEPARTMENT OF HUMAN SERVICES TO ENTER INTO ADDITIONAL CONTRACTS WITH PROVIDER AGENCIES TO OPEN ADDITIONAL HOMELESS SHELTERS IN WAIPAHU. HCR98 URGING THE CITY AND COUNTY OF HONOLULU TO ADD HANS L'ORANGE NEIGHBORHOOD PARK TO THE LIST OF SECURED PARKS ON OAHU. HCR99 URGING THE COUNTIES OF THE STATE OF HAWAII TO IMPLEMENT PROCEDURES OR TECHNOLOGIES TO EASE THE PROCESS IN WHICH DRIVER'S LICENSES ARE RENEWED. HCR100 REQUESTING THE DEPARTMENT OF TRANSPORTATION TO SEEK ASSISTANCE FROM THE FEDERAL GOVERNMENT TO FUND OR PERFORM A STUDY ON ALL POSSIBLE TRANSPORTATION OPTIONS TO REDUCE TRAFFIC WITHIN THE CITY AND COUNTY OF HONOLULU AND IN THE OTHER COUNTIES OF THE STATE OF HAWAII. HCR101 STRONGLY URGING THE CITY AND COUNTY OF HONOLULU TO AMEND THE REVISED ORDINANCES OF HONOLULU TO REQUIRE THE DEPARTMENT OF ENTERPRISE SERVICES TO MAKE HOLDING COMMENCEMENT EXERCISES AT THE NEAL S. BLAISDELL CENTER A FIRST-PRIORITY USE. HCR220 HD1 SD1 REQUESTING THE ATTORNEY GENERAL TO CONVENE AN AUTONOMOUS VEHICLE LEGAL PREPARATION TASK FORCE. HR58 DESIGNATING THE FIRST WEEK OF MAY AS TARDIVE DYSKINESIA AWARENESS WEEK. HR61 REQUESTING THE HARBORS DIVISION OF THE DEPARTMENT OF TRANSPORTATION TO CONVENE A TASK FORCE TO STUDY THE FEASIBILITY OF ESTABLISHING A HAWAII COMMERCIAL HARBORS AUTHORITY. HR82 REQUESTING AN AUDIT OF DEPARTMENT OF TRANSPORTATION PUBLIC WORKS PROJECTS AT THE DANIEL K. INOUYE INTERNATIONAL AIRPORT. HR89 URGING THE CITY AND COUNTY OF HONOLULU TO WORK WITH STATE IN DEVELOPING STRATEGIES TO PROVIDE ASSISTANCE TO THE HOMELESS AND REDUCE THE NUMBER OF HOMELESS INDIVIDUALS IN WAIPAHU. HR90 REQUESTING THE DEPARTMENT OF HUMAN SERVICES TO ENTER INTO ADDITIONAL CONTRACTS WITH PROVIDER AGENCIES TO OPEN ADDITIONAL HOMELESS SHELTERS IN WAIPAHU. HR91 URGING THE CITY AND COUNTY OF HONOLULU TO ADD HANS L'ORANGE NEIGHBORHOOD PARK TO THE LIST OF SECURED PARKS ON OAHU. HR92 URGING THE COUNTIES OF THE STATE OF HAWAII TO IMPLEMENT PROCEDURES OR TECHNOLOGIES TO EASE THE PROCESS IN WHICH DRIVER'S LICENSES ARE RENEWED. HR93 REQUESTING THE DEPARTMENT OF TRANSPORTATION TO SEEK ASSISTANCE FROM THE FEDERAL GOVERNMENT TO FUND OR PERFORM A STUDY ON ALL POSSIBLE TRANSPORTATION OPTIONS TO REDUCE TRAFFIC WITHIN THE CITY AND COUNTY OF HONOLULU AND IN THE OTHER COUNTIES OF THE STATE OF HAWAII. HR94 STRONGLY URGING THE CITY AND COUNTY OF HONOLULU TO AMEND THE REVISED ORDINANCES OF HONOLULU TO REQUIRE THE DEPARTMENT OF ENTERPRISE SERVICES TO MAKE HOLDING COMMENCEMENT EXERCISES AT THE NEAL S. BLAISDELL CENTER A FIRST-PRIORITY USE. HR169 HD1 REQUESTING THE VARIOUS GOVERNMENT ENTITIES RESPONSIBLE FOR INSPECTING CARGO SHIPMENTS TO HAWAII TO COORDINATE THEIR EFFORTS TO ENSURE THAT EVERY SHIPPING CONTAINER ORIGINATING FROM OUTSIDE THE STATE IS INSPECTED FOR ILLEGAL GOODS. HR195 HD1 REQUESTING THE ATTORNEY GENERAL TO CONVENE AN AUTONOMOUS VEHICLE LEGAL PREPARATION TASK FORCE. HR216 CONGRATULATING THE WAIPAHU HIGH SCHOOL MARAUDERS FOR WINNING THEIR FIRST-EVER HHSAA DIVISION I FOOTBALL STATE CHAMPIONSHIP. Representative Aquino represents State House District 38 of Waipahu. 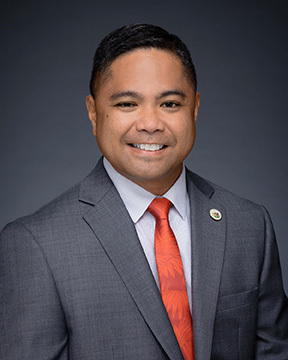 He is a graduate of Waipahu High School and holds an Associate Degree of Applied Science (Administration of Justice) from Honolulu Community College, a BA in Public Administration from UH-West Oahu, and a MA in Communications from Hawaii Pacific University. As a lifelong Waipahu resident, Representative Aquino continues to be engaged in many aspects of the community he is proud to represent. He is currently the Chair of the House Transportation (TRN) committee. In addition, he also serves as a member of the Housing (HSG) and Consumer Protection & Commerce (CPC) committees. Representative Aquino was first elected to the House of Representatives in 2008.